Comfort, speed, class --- that’s what you’re in for aboard ANAHITA, a 62-foot Dynamique that accommodates six guests and two crew. Fully air conditioned and beautifully appointed below deck, expertly designed for performance on deck, this luxurious sailing yacht transports you to an experience beyond sailing. Each of three guest cabins has en suite head; choose from one with double bunk, queen bunk, or upper/lower single berths. Crew have access to their own quarters via a separate companionway. Amenities include full television and audio entertainment systems, kayak, water skis, snorkeling and fishing gear, and hammocks. The chef can accommodate special diets. 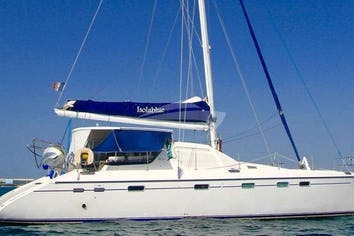 ANAHITA accommodates 6 guests in 3 en suite cabins. The Forward cabin has one double bed, settee, en suite bath with manual head, sink and shower. The Port cabin has upper/lower single berths and en suite bath with manual head, sink and shower. The upper berth is removable. ANAHITA is fully air conditioned through out. Inquire for all night use. Crew cabin with a separate companionway, head and shower. Roseanne's menus encompass a variety of international cuisines and she cheerfully accommodates special requests, offers tasty adaptations for special diets and loves to create original hors d’oeuvres and desserts. served on toasted English muffin. A fine breakfast of poached eggs on slices smoked salmon andspinach topped with silky Hollandaise sauce served on toasted English muffin. Lightly fried Eggson slices of grilled garlic ciabatta layered with crispy prosciutto and fresh creamy mozzarella drizzled with pesto and diced tomatoes. An array of chocolateand fruit filled croissants, or muffins, cinnamon rolls. Variety of cereals served with yogurt. Toastserved with preserves and fruit juices. Served with a medleyof warm spiced apples and bananas infused with syrup and an assortment of freshberries. Served with Frenchbread and an egg custard blend and cinnamon topped with a drizzle ofhazelnut and pure Canadian maple syrup. Served in pineapplehalves with a hint of curry in the dressing; includes tropical fruits such a smangos and pineapple chunks. Two hands down, this is the best coconut shrimp with no exception with home make apricotmarmalade curry dipping sauce, served with Anahita coleslaw. Choice of smoked tunaor chicken stuffed with mango, cilantro and red onion with homemade Asiandressing served with avocado salad. Comes with a medleyof traditional spices, and served with Anahita potato salad. Couscous salad ispacked full of veggies and amazing flavors that all blend together amazingly well,served with melon and prosciutto. Layered half ofchicken and vegetable mixture, sprinkled with cheddar cheese and our specialsauce; served with avocado salsa and tortilla chips. Platters overflowingwith surprising and delightful flavor combinations. And the burgers are smothered with mouthwatering toppings. Romantic dinnerfillet mignon served with pineapple, mango, red pepper relish, and bakedpotato. Grilled porktenderloin with orange balsamic glaze, garnished with chopped parsley, cilantroand diced apricots; served with our special sweet mashed potatoes and seasonedvegetables. Comforting lasagna and Mediterraneanspaghetti; served with homemade tomato sauce, Caesar salad, and homemade garlicbread. Boneless Chickenapricot with cranberries and apricot sections served with spinach orzo andginger honey carrots. Grilled crushed sesame Tunasteak or Grilled Mahi Mahi, (Dorado) served with wasabi sauce, rice andassorted steamed vegetables of the season. Cheese log: Composed of three cheeses, special herbs, and spices rolled in withchopped walnuts, and served with a medley of crackers. Red salmon pate with a twist of lemon and pita servedwith crudité and crackers. Served with crudité, crackers, and pita. Shrimp with homemade sea food cocktail sauce, creamcheese and triscuit crackers. Composed of a medley of parmesan cheese, bacon bits,black olives, garlic, onions and secret sauce on pumpernickel or rye beard. We feel blessed to have been a part of the Anahita family these paste 8 days--It seems much shorter yet much longer too. You too are an amazing team- talented, gracious and kind. Thank you for hosting us, and for all your wonderful care. We thoroughly enjoyed the time together, you made everything a pleasure. We hope to see you again in the Caribbean. Jimmy, Susan, Andrew Jamie and Matthew. Barge. We feel so blessed that we were sailing on your beautiful Anahita for our first trip to Croatia with the Riverside Yacht Club. Anahita sails as well as any boat we have ever sailed on, and Roseanne Spoiled us with delicious meals and appetizers. Thank you for sending us home with one of your recipes! Bijan, thank you for showing us so many beautiful places, and for sharing your special rum. Thank you for your beautiful hospitality and graciousness. Anahita is a lovely place to be. The meals, the wine and the rum were all spectacular. Thank you for making this a very special vacation with wonderful memories to carry home with. All the very best, Mitzi, Ellen, and Bob. Thank you so much for an unforgettable holiday, sharing your home making it ours for our short stay. This holiday has been very special making milestones and a holiday we have wanted to do for a long time! Roseanne you are an amazing hostess and cook. Loved it all! Bijan, we thank you for going to Petit Tabac, Always look for, "Life's first". You are a very special sailor. Thank you ! for making our first sailing trip very special. Cheers and many more years of happy sailing. Hope to see you again. I will always remember my first sailing holiday. Now I know for sure what I want to do when I grow older. Thank you for a fabulous week in the BVI's. Your hospitality and attention to us was very special. In planning this trip, we paid particular attention to the captain and crew, in hopes that we would all be very compatible and friendly. You both made this trip so warm and wonderful for us. Roseanne, I never dreamed the food would be anything like the continuous superb meals in all of my travels. I have never had three fantastic meals plus snacks for seven days. Thanks. This was the first sailing trip for my daughter Alex, my niece Laura, my sweetie Brian and myself, and you two made it a spectacular first! It was wonderful to hear all about your travels and adventures. Your knowledge about the BVI's was so helpful in knowing lots of fun places for snorkeling and tubing. You two are such kind and gracious hosts and you made us feel special from the first minute we met. 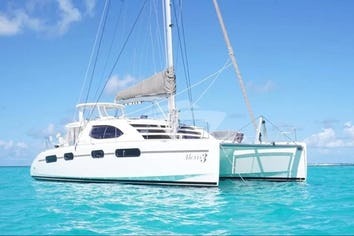 I will eagerly recommend you and Anahita to anyone I know who is looking to charter a boat. Thank you for the best vacation! I have always wanted to try sailing and I loved it! Bijan- thank you for teaching me how to sail! Roseanne, you are wonderful and your food was so good! We had so much fun with both of you dancing at Foxy's and playing games on the boat. Don't be surprised if you find a stowaway! I don't want to leave! Thank you both for everything. I am so blessed to have met you both! You are both such amazing and kind people! I had a wonderful trip and do not want to go home. Thank you for your hospitality and generosity, it didn't go unnoticed. I will surely recommend you to anyone looking for a fabulous sailing trip! Bijan - thank you for working so hard to make our trip as enjoyable as possible. I will miss you Roseanne - You have such a kind and gentle spirit and I will miss your beautiful smile. I hope you have many more fabulous trips to come! Thank you both for everything. I will never forget you! Keep in touch! I've had the pleasure of crewing for Bjian Kalantari twice, (on) both Trans-Atlantic crossings in 2009. Rosanne (the chef) is an amazing person, (Bijan) a gracious host and their operation is top notch. The vessel is pristine, fast and very comfortable. Bijan's skills as a captain are excellent and I would highly recommend Anahita for your next trip, you will not be disappointed. Keep up the good work Bijan, nice job. Thank you very much both Bijan and Roseanne, for a wonderful week on ANAHITA. In spite of the fact that the wind was not much in our favor, she was a lovely boat to sail and we enjoyed exploring the different islands- and particularly our favorite spot on Mljet. Lots of brilliant snorkeling, kayaking, windsurfing, and climbing, (and cliff jumping). for boys. We were looked after brilliantly by you both, so we had a lovely relaxing time, Roseanne particularly- thank you for endless delicious meals and all your slaving over a hot stove while we were having fun. A brilliant, memorable and relaxing week! Thank you both so much for an incredible honey moon! It was fun, relaxing and romantic. Bijan your choice of islands was perfect for us - we specially liked Lopud and Sipan. Roseanne. we couldn't have asked for better food, and will definitely be contacting you for some recipes! In planning our future vacations, we will definitely keep Anahita in mind. Or perhaps one day we will sail with you in our own boat, since both of us have been inspired to take up sailing. Thank you for a fantastic trip! You were the perfect hosts and our vacation couldn’t have been better. We had good weather, nice wind and fun activities every day. We have fun stories from the entire trip. The food was some of the best that we have had. We were amazed every night by what came up from the galley. Thank you for your attention to every detail. We will remember you both and hope to see you again soon! Thank you for a wonderful trip. The food was excellent, the sailing inspiring, and the care and attention Bijan and Roseanne showed to me and my family was heart-warming. Look forward to our next trip!!! We had a wonderful time, thank you so much. on to your ANAHITA home, and made us feel so welcome. having dinner on board and the many trips back and forth to shore at odd hours on the tender. with how it turned out. It is the end of an era for us but also a new beginning. Thank you again for making it so special! We just finished our wonderful Atlantic crossing. We couldn’t have found a better boat, a better captain and better chef for this wonderful experience in or lives. Thank you very much for all your attentions during the (whole) trip. Very well done, Bijan and Roseanne! We thoroughly enjoyed the charter. The crew was fabulous – helpful, friendly, accommodating and particularly kind to our 8 year old granddaughter. The yacht was spotless, comfortable and well maintained. The meals were excellent – (both in) quality and presentation. We would absolutely charter this yacht again . . . really can’t think of anything we would change about this trip. Bijan and Roseanne were excellent companions and worked very hard to provide us with the best possible experience. This has been a sailing vacation for the record books. We have never had as much fun as we did with the two of you. Rail down, big waves. The food was perfect, the menu fresh and copious, and the company outstanding. Our fourth trip in four years. We have sailed the West Indies with you from Petite St. Vincent to St. Martin, (And of course a lovely sejour along the coast of Maine). This trip from St. Martin to St. Barth, Statius, Saba, St. Kitts and Nevis was magnified from the truly remarkable gourmet kitchen commanded by Roseanne to the superb sailing under Bijan’s guiding eye. No detail was too small, no kindness overlooked. Your hospitality is without peer. We all have had a wonderful rested week. Thank you for once in a lifetime experience! Cruising the BVI gave us an experience that was much wider than anything we could have gotten by staying in a single point. Your patience with our relative lack of water experience was appreciated. You made sure that everybody got to do what they wanted. Thanks for the gourmet meals and giving us lunch on the beach. The food was fabulous. Please look us up should you ever find yourselves in the Port of Chicago. … I contacted the client and they couldn't have spoken any better about the crew and trip. What a wonderful 10 days! We had everything from storm to sun. Thank you for the wonderful hospitality and excellent cuisine! We had some great adventures, and I look forward to cruising with you again. It's been a pleasure getting to know you both. 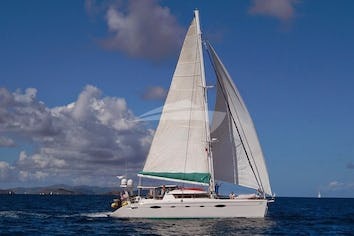 Thank you for a marvelous charter aboard Anahita! We have enjoyed your hospitality and companionship. I have many great memories that will return to the States with me. Would love to see you in Newport. We thoroughly enjoyed our cruising time with you. Your boat is lovely. We had a wonderful vacation. The last week was an amazing experience! You are both such wonderful people and very welcoming. You have made us feel so at home all week. We will miss smelling the home-cooking from below, with mouths watering in anticipation…and only miss more the spectacular tastes once served to us!! We wish you well with future travels and know that you will continue to impress other guests beyond expectations! Thank you so much for your service and help over this past trip. Hope you are well and hope for the best for your crossing. We thoroughly enjoyed our week with you, Bijan and Roseanne You were super hosts, and we enjoyed the warmth and hospitality of your company. Roseanne’s culinary skills will make it hard to return to our own cooking at home! Thank you for making our first experience in St. Martin, St. Barts, Saba and rest an exceptional vacation. All the best on hour trans-Atlantic crossing! Sensational, Bijan and Roseanne! Truly memorable, a terrific experience aboard ANAHITA – a beautiful yacht. We’ll look forward to joining you again, God willing! A magnificent sojourn from St. Vincent south- The Mustique Jazz Festival with Papa George, Dona Gillespie, and others. Then to Tobago Cays, a magnificent cloud and seascape and fabulous reef when Audrey learned to snorkel. Then to Petite St. Vincent and back through the islands to St. Vincent. Wonderful sailing and gourmet cooking, Bijan’s superb selection of music and great views offer a great deal to have the Island experience. Many thanks for a great week. What an inspiration this trip has been, traveling from St. Vincent to the Grenadines to Petite St. Vincent and back. This is certainly another world beyond ours..............of much leisure and beauty, but still a stimulating one that is so appealing. You are a wonderful host and captain, and Judy is such a lovely companion, crewman and cook. You present a fantastic situation that lives in memory for years to come. Thanks again for a fantastic week. What a treat it was to spend time with such an expert in such an exquisite place. You provided more than one could ever wish for on such a trip and the memories will live for years. We greatly appreciate all of your efforts on our behalf. Hope all is well with you and your beautiful boat. I wanted to thank you so much for a wonderful trip with memories to last a life time. When we left it was like leaving a part of my family behind, and was difficult to say goodbye. I had such a great time, even though I was a bit concerned with the sailing part as this was my first time do so, but your wonderful boat Anahita came thru with flying col ors. It is very cold and raining here today and you can imagine where I would rather be, soaking up the sun shine and being with my new friends. I hope you will stay in touch with us as you travel and let us know how you are doing. I hope that we will meet again and be able to take another trip with you perhaps in the Med. Take care and be safe our prayers for safe journey go with you. I have been meaning to be in touch to thank you for a remarkable week. It was a true pleasure to be with you and Judy. Yesterday at lunch with Al I mentioned that the journey really could not have gone better--everything just seemed to fall into place. Al and Audrey had a wonderful time. Your mastery of the ship and the waters was a pleasure to watch --and Judy's world class Pastry Chef productions remain fixed in my memory. Have you made a decision about the marathon trip to Australia?? Do you still plan to cross the Atlantic? All of us would very much enjoy seeing you again. "Keel hauling" us.......It was a wonderful week, and you took good care of us. The Tobago Cays are something we will never forget. Good luck to both of you....... Thank you for making our sail around the Grenadines so special. The sailing was exciting, the food delicious, the weather, company, beaches, and water were beautiful. 10 days went by much too fast. We will miss you. A honeymoon we will never forget! Perfect amount of adventure, relaxing, and some of the most amazing snorkeling and water we have seen. Sandy Island,(Carriacou), was a true paradise. Bijan, you were an amazing host/captain from beginning to end make a terrific rum punch. Barbara we enjoyed every meal you prepared, as we were totally spoiled for the whole four days. Thank you both. The wonderful honeymoon will always be in our memory. I sailed with Captain Bijan from NEWPORT to the HUDSON RIVER 79th Street Boat Basin. Bijan's automatic pilot and electric sheet winches and the main halyard winch allow him to siglehand his 62 ft. DYNAMIQUE sloop. His ballet training provides catlike movements to tend to all of ANAHITA'S required tasks. His involvement in high fashion business included opening and managing, together with his ballet dancer wife, LOTHAR'S FRENCH FASHIONS SPORTSWARE STORES on RODEO DRIVE in LA, and across from BERGDORF'S. Come meet him at the EXPLORERS CLUB BARBECUE July 25th at the clubhouse 46 East 70th Street. Appolo and I have just spent the last week abord S/Y Anahita. We did some water skiing and snorkling. The sailboat performed very well under many different points of sailing. We did two of our favorite hikes, one on Peter Island, and the other on Virgin Gorda. The crew Captain Bijan, and cook Carmen were delightful and extremely pleasant. They worked very hard to satisfy our every whim. But when all was said and done we will miss them both. We truly hope that our paths will cross again. An extremely delightful week, with a fabulous picnic on the beach on Anegada, and return to Sandy Spite Island with it's idyllic palm tree. We had a great time sailing, snorkling, and discovering the Baths and other islands. These are memories that we will keep for a lifetime. What a fabulous week! From gourmet meals to an array of fascinating activities with wonderful libations intertwined; it has been perfect. Thank you Bijan and Judy for creating our memorable family vacation. We have had a great time on Anahita. I have really enjoyed all of the activities. I liked the food. I have improved my water skiing a lot. I loved snorkeling at the choral reefs. Thank you for a lovely holiday in the Caribbean. I have improved a lot on my water sports. I specially liked the water sports the most. I specially liked water skiing, and donuting and snorkeling. Sorry to be so slow getting back to you. I am still dreaming of the trip. pefect scenery and great water for sailing. We could have used a little more wind, but certainly had some good ones, and hey, you take what you get in that department. Anahita was a great boat to make the trip on -- lots of sun, protection from the rain and wind if you want it, and great comfort, yet a boat capable of handling anything. When friends ask where I was, they are all terribly envious. I'd go again in a minute! Best regards to you -- I hope the two week trip is as successful as ours was. I enjoyed enormously a 2 weeks' cruise with you all. Going to Roque Island was a unique experience, a highlight amongst others. Friendship forged while sailing is like discovering the truth that friendship may endure. May your future have fair winds and calm seas. I enjoyed cruising along the Maine coast with you aboard S/Y Anahita. The boat is well balanced and sails well on all points. Going well to windward particularly is the test of a sailing vessel. May you have fair winds and gentle seas.